How do I know what size belt to order? 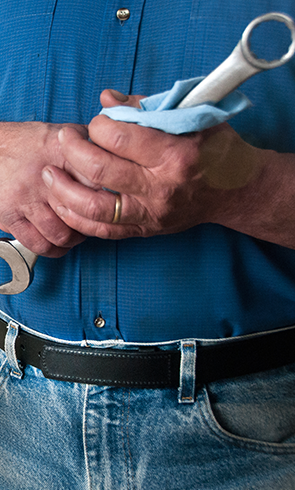 When ordering a Mechanics Belt, you should order your belt the same size as your pants size. Example: If you wear a 32" waist size pants then you need to order a 32" belt. We measure the Mechanics Belts in such a way that all we need is the waist size. If you still have questions about what size belt to order, please call us toll free at 1-877-955-0055 and we will be glad to answer any questions you have. Do your belts come in large sizes? Our regular belt sizes are 28" - 46". We do make larger belts; add $4.00 for 48" and larger sizes. How wide should the belt I order be? This depends on how you are going to wear the belt. If you are going to wear the belt with dress pants or slacks then the 1-1/4" width is the more preferred width. For jeans or casual wear the 1-1/2" width would be fine. Pants loops seem to be getting more narrow so check before you order this width. Some Dickies Brand pants have narrow loops. Note: Some Mechanics Belts are only available in the wider 1-1/2" width. Can I mail my order to you with a Money Order or Check? Just click this option and follow the instructions on the address information page. Once you hit the submit button you will have a printable order form that you may mail in with your check or money order. Our address is on the form. Enclose a Check or Money Order for the amount due and that's it. For the best shipping rates, we ship all packages by Priority Mail. You will receive your package in your mailbox or Post Office box. Please call us toll free at 1-877-955-0055 if you need your package sent by UPS. We make all the Mechanics Belts by hand, so you may need to allow 3-5 days of production time (usually 3 days max). If you will need your belt in a hurry, please give us a call and we will try our best to accommodate you. How long will it take for me to get my order once it is shipped? We ship by Priority Mail which usually takes 3-4 business days to arrive. We are on the East Coast of the USA so where you are determines the amount of time. We have found out that it takes about 4 days to get orders to California from where we are. If you need Express Service, please call us toll-free at 1-877-955-0055. What if I need my order shipped Next Day Express? This can be arranged for certain items, and if the order is placed early enough in the day. This is not a recommended method of shipping. Express US Mail no longer guarantees overnight delivery to most areas. They say it will be two days in most cases. We will make every effort to try to help you. What does "Limited Lifetime Warranty" mean? Each Mechanics Belt comes with a limited lifetime warranty on all hardware and stitching. We will repair and ship your belt back to you as long as you own it. A quality, genuine leather belt designed exclusively for mechanics. Our no scratch belts are handmade in the USA, and offers a limited lifetime warranty. Lots of styles and colors to choose from.